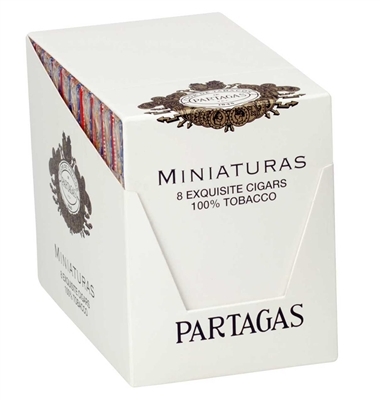 Partagas Miniaturas Cigars are small sized flavorful cigars that continue the tradition of quality Partagas smoke. They are comprised of the classic Dominican and Mexican tobacco blend. The outer covering is made from a toothy Cameroon wrapper. They exude a medium bodied smoke with dominant flavors of spices, wood, and coffee. They are solidly built ensuring a smooth smoke on the go. They are perfect smoke to enjoy during short breaks or just any time of the day. These Partagas Miniaturas Cigars have the length of 3 1/4 inches with a ring gauge of 26. They are packed in tins of 8 and a pack consists of 10 such tins.